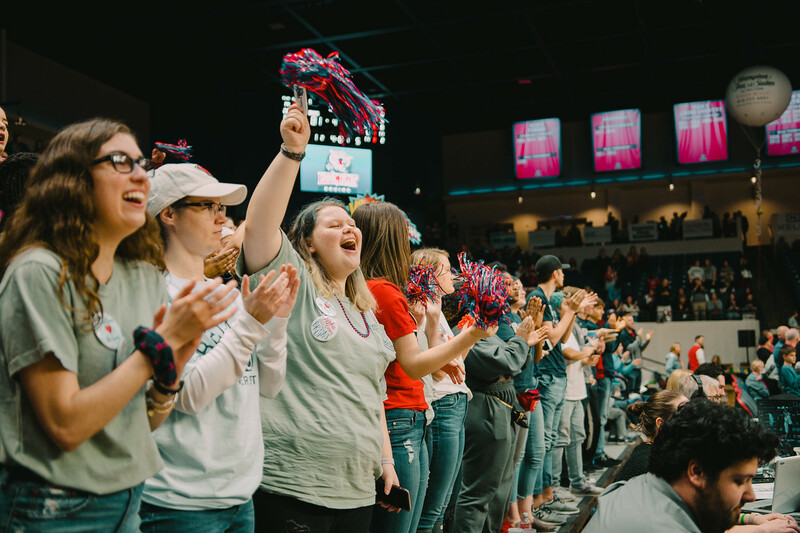 Belmont’s 2019 Homecoming celebration brought many Bruins back to campus for the week-long schedule of events held February 18-23. The theme, A Celebration of University Life, featured activities and festivities that appealed to students, faculty, staff and alumni. The week began with a special Chapel centered around Mission Monday and included a non-profit fair where organizations from around the Nashville area displayed their work for members of the Belmont community. The day concluded with a student trivia night, hosted the Student Activity Programming Board. On T-Shirt Tuesday, Belmont students were encouraged to ‘give a shirt, get a shirt’ as this year’s Homecoming t-shirts were distributed on campus. WOW Wednesday provided an opportunity for ‘pop-up events’ to celebrate Homecoming in a unique way. The day began with doughnut holes and coffee in the Massey Lobby, a crowd favorite sponsored by the University Staff Affairs Council and ended with a surprise Zumba class sponsored by CHARG, a student organization dedicated to women who are interested in athletics and movement. The day also included a popcorn bar hosted by members of Belmont’s Senior Leadership Team. Thank You Thursday included opportunities for Belmont faculty, staff and students to write thank you notes, and a Belmont Faithful Donors Luncheon was hosted in Harrington Place Dining. The weekend’s events began on FANtastic Friday with the Homecoming Chapel and the annual Homecoming in the Round Concert. Saturday was packed with events including the Homecoming Prayer & Worship Ceremony, the annual Tailgate at the Tower, the Homecoming Carillon Concert and a series of meet-ups for alumni across campus. At 3 p.m., the women’s basketball team kicked off a day of successful sporting events as they defeated SIU Edwardsville in the Curb Event Center with a final score of 87-54 (and accepted their OVC Championship Trophy). Immediately after, the Men’s Basketball Team defeated SIUE with a similarly impressive score of 97-75. The Curb was ablaze all evening as both games were the final home events for the men’s and women’s basketball teams – meaning their seniors won’t find themselves playing on that floor again. To celebrate the moment, the women’s game began with a senior presentation where each senior was recognized alongside her family members. The evening ended with a huge celebration of Men’s Basketball Head Coach Rick Byrd’s most recent accolade – his 800th career victory, achieved in the Curb just two nights prior. Byrd was presented with the game ball from that win, a special jersey with an iconic ‘800’ on the back and a special trophy. He took center court after both games ended, thanking his family, staff members, players – past and present, administration and most importantly, God. Homecoming 2020’s dates have been set and the team will soon begin meeting to plan events. We’ll see you next year for yet another successful celebration of University life!